Not everyone in China is part of this revolution, of course. The World Bank Global Findex database, which measures financial inclusion, estimates that as of lat year some some 200 million Chinese rural citizens remain unbanked, or outside of the formal financial system. As in Sweden, the shift toward cashless is raising issues around exclusion and marginalisation. There are, for example, supermarkets with different lanes for cash or cashless payments that act as physical manifestation of social stratification between, as Foreign Policy notes, the young and the old and between the urban middle class and those left behind (between, as David Goodhart would put it, the “anywhere” and the “somewheres”). I’ve written before that we will see the same in the UK as cash vanishes from middle class life to become the preserve of the rich and the poor who will use it for tax evasion and budgeting respectively. A “Which” survey found that over 75% of low-income households rely on cash, as well as over 80% of elderly households. The shift to cashless society must be planned to help these groups so that they share in the benefits of cashlessness. Cash is vanishing even in Woking. I think we should start to plan for this now. In China, as in Sweden (where the New York Times observes that “cash is disappearing in the country faster than anyone thought it would“), we are beginning to see what happens to societies that slide into cashlessness. I am against this. That is, I am in favour of cashlessness, but I am in favour of it as a policy decision by society that is implemented to meet society’s goals. I couldn’t disagree more with the Wall Street Journal’s view that the move to cashless society “should be left to technological advancement”. No, it should not. This is a matter of great importance and with significant implications for society. The strategy should therefore be set by society, not by technologists. Now, clearly, technological advances deliver new possibilities to policymakers and it is good for technologists to explore these possibilities. But, as they say, just because something can be done does not mean it should be done. We need a proper debate and a regulatory envelope set out to move forward. 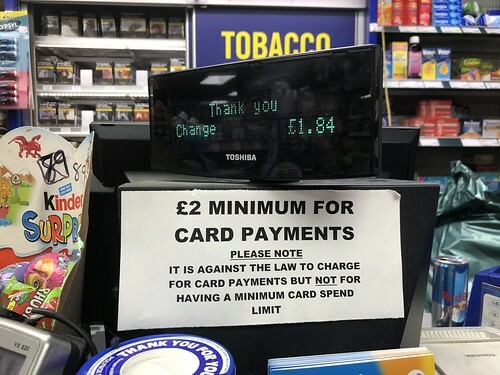 I wonder if we might seize the opportunity and set down a technological marker for post-Brexit Britain by declaring that cash will be irrelevant in the UK in a a decade. That is, anyone who needs to pay for anything will be able to do so electronically and that anyone who does not want to pay electronically will be presented with a method for paying in cash, albeit one that they have to pay for like (like cheques). This must mean that in parallel we must set a national goal to provide a free at the point of use electronic payments infrastructure for everyone. Otherwise we’ll end up where they are in America, where jurisdictions are trying to ban cashlessness (and thus keep the cost of the payment system high, especially for the poor) in the name of social justice. In New York, Congressman Ritchie Torres has put forward proposals to force businesses to accept cash and called them a a “new frontier” of anti-discrimination law that is needed to prevent a “gentrification of the marketplace”. Similarly, as the Washington Post reports, lawmakers in the nation’s capital have introduced a similar bill. A council member there said that by refusing cash businesses are “effectively telling lower-income and younger patrons that they are not welcome”. Maybe, but if so it’s only because those demographics don’t spend enough to provide the margin needed to cover the cost of cash. It’s time to start thinking about what the requirements for that infrastructure are and consulting consumer organisations, businesses and government departments on their needs. We need to make a cashless Britain, not simply allow a cashless Britain. 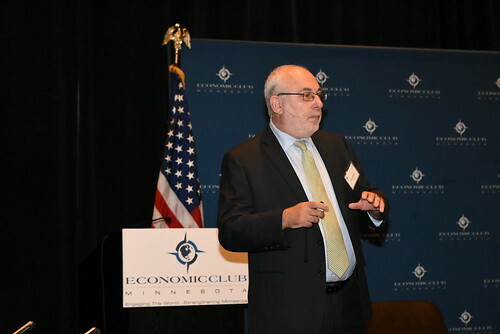 The wonderful people of the Economic Club of Minnesota (ECOM) invited me to Minneapolis to give a talk at their October luncheon. I was talking, generally speaking, about my “5Cs”: the potential issuers of future digital currencies. If you click on this picture, it will take you to a video of the talk and the Q&A session afterwards. One of the points I made in the talk was the payments in the future are about my mobile phone talking to your mobile phone, not me handing something (banknotes, credit cards, cheques, whatever) to you. This means that the adoption of new forms of money can accelerate without updating or replacing cash registers or plastic cards. The mobile phone is taking us into a cashless future. The Club had arranged for a driver to pick me up from the airport and take me to the hotel. He was very interesting man of Somali origin and we had a nice chat in the car. By the time we got to the Hilton, I thought I ought to call my hosts and ask them to have him onstage instead of me! Well, he told me about his last visit to the old country, when he was surprised to find himself paying for everything (and he meant everything, from a nickel payment in the food market to a $400 remittance to relatives) using a mobile phone. “It works on trust”, he told me, “because there is no government”. Mobile payments are spreading. New interfaces (voice), new security (face), new authentication techniques (continuous passive authentication) and evolving network coverage mean that mobile phones are simpler and more secure than cash for a great many people around the globe. But which country will win the race to cashlessness? Well, that’s where my driver comes into it. My reasoning as to why he might have been a good choice for a speaker, apart from the fact he was smart and loquacious, is that it is his motherland, rather than the UK (or Sweden, or even the USA, where the Federal Reserve tell us there are now more $100 bills in circulation then there are $1 bills) that may well become the world’s first cashless country. A recent World Bank report showed that Somalia has one of the most active mobile money markets in the world, outpacing most other countries in Africa. It’s even superseded the use of cash (their words, not mine) in the country. Let me repeat that for emphasis. The World Bank say that in Somalia, cash has been “superseded”. It is approaching irrelevance (apart form anything else, no-one uses it there because of widespread counterfeiting) as Somalia heads toward cashlessness. Interestingly, within Somalia there is already an almost cashless enclave where “payments through mobile she says have rocketed from 5% two years ago to more than 40% now”. That enclave is Somaliland (the breakaway republic of 3.5m people within Somalia), and it may well be Somaliland, rather than powered-by-Swish Sweden, as the place where cash will first vanish into memory. And if your memory is good, you may recall that I wrote about it six years ago, when I said that “Somaliland might well become the world’s first cashless country. Not Iceland or the Netherlands, Korea or Kenya, but Somaliland”. While in urban China, cash is becoming obsolete, it is still widely used outside the cities, which is why I still think that Somaliland might win the race though, just as I said all those years ago. Don’t listen to me about it, listen to what Mr. Rashid, a tea seller there, has to say about it: “I never see cash”. And his teas sell for 2,000 Somaliland Shillings each. Which is about 25 cents. A quarter. And his customers use phones to pay. The world of mobile payments has fascinated me from its earliest days and I’ve been able to observe its evolution first hand. My colleagues at Consult Hyperion worked on the UK’s first prepaid scheme, first WAP “walled garden”, the first NFC trials and, I’m proud to say, M-PESA in Kenya. Experience has given a pretty realistic picture of what is happening across the payments industry in general and mobile payments in particular, and my view is that we are heading toward a tipping point that will see us accelerating toward cashlessness. In our United Kingdom, the value of currency in circulation has dropped, year on year, for seven consecutive months (see chart), for the first time since records began in the 1960s. This is something of a surprise. For many, many years the use of cash for purposes such as shopping has been steadily decreasing while the amount of cash “in circulation” has been steadily increasing. Broadly speaking, the use of cash for legitimate activities has been falling while the use of cash for drug dealing, money laundering, tax evasion, payments to corrupt officials and so on has been rising. Hence my surprise at this shift in the statistics. Of that cash that is “in circulation”, the £16.5 billion in £50 notes is particularly puzzling. Earlier this year the Treasury said that £50 notes were “rarely used” for routine transactions and that “there is also a perception among some that £50 notes are used for money laundering, hidden economy activity, and tax evasion”. I’ll say. This perception is widespread, by the way. A couple of years ago Peter Sands, the former head of Standard Chartered, said that the main use of the £50 was illicit and he’s a banker not a mere blogger such as myself. Given this perception, I would have thought that is was time for the Treasury to tell the Bank of England to stop making life easy for criminals and withdraw the £50 over a two year period. But apparently not. Given that no-one is using them for legitimate purposes, the Bank of England has decided that now is a good time to bring the £50 up to date and make it out of plastic. Robert Jenrick, exchequer secretary to the Treasury, explained the decision by saying that “people should have as much choice as possible when it comes to their money and we’re making sure that cash is here to stay” although I don’t think anyone in the Treasury or anywhere else was asking for cash to be removed from circulation, only for a narrowing of the spectrum (dumping 1p and 2p coins, two-thirds of which are only used once, and removing £50 notes leaving the £20 as the highest denomination). Oh well. I suppose tax evaders are more of an electoral force than I thought. 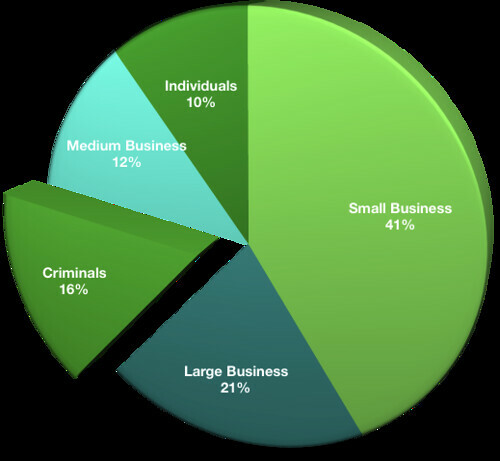 According to the HMRC’s latest estimates that are shown the chart below (for 2016/2017), almost half of the tax gap is down to small businesses and they account for nearly three times as much of the missing tax as “criminals”. I’m not sure if these groups are natural Conservative voters, but they must in some measure account for the governments reluctance to inconvenience those responsible for the lion’s share of missing taxes. As an aside, the Bank says that it wants a scientist to be the face of the new notes and (god help us) says it will ask the public who it should be. But why a scientist? That doesn’t seem appropriate to me. Surely a much better choice would be the late and much lamented national treasure Sir Kenneth Dodd of Knotty Ash who, rather famously, kept enormous piles of cash in his attic because he didn’t trust banks. Or perhaps one of our greatest jockeys, Lester Piggott, who was once sent down for three years for tax evasion. I think the Bank should be told: the medium is the message. Why do I keep going on about this? It’s because the people who benefit from the convenience of £50 notes (eg, builders avoiding VAT) are doing so at the expense of law-abiding tax-paying citizens (eg, me) and I have to fill in my tax form soon. In 2016, cash was used for 44% of all consumer transactions in the UK. That was down from 50% the previous year and from 68% a decade earlier. Victoria Cleland, Chief Cashier at the Bank of England says that the value of notes “in circulation” has been increasing year on year for the past decade or so and that “we are still seeing growth in total demand for cash”. This seems puzzling, considering that this year the UK will see 13.4 billion debit card payments (of which a third will be contactless) but only 13.3 billion cash payments (according to PaymentsUK). Now, as it happens, Victoria and I were both guests on the BBC’s flagship personal finance programme Moneybox last month [you can listen to the show here]. We’d been invited to take part in a phone-in about the trend to the cashless society, along with Andrew Cregan (Head of Payments Policy at the British Retail Consortium). The topic had been triggered by the head of the Swedish central bank calling for a pause in Sweden’s rush to cashlessness. At the end, Victoria and I rather agreed on the need to have a strategic conversation about cash at the national level. The issue in Sweden is that cashlessness is just happening: it’s not part of a plan that addresses the issues associated with a cashless economy (eg, inclusion). In the UK, we can learn from this. But back to the steady growth in notes “in circulation”. The trend growth of cash in circulation running ahead of GDP growth isn’t a UK phenomenon. The amount of cash “in circulation” around the world has gone from 7% of GDP in 2000 to 9% of GDP in 2016. On the show, I couldn’t resist an oblique snark about what these notes being used for (ie, money laundering, tax evasion and so on) since they aren’t being used to buy things. That’s right. Banknotes, statistically, not being used to buy things. Cash is no longer primarily a means of exchange. The latest figures from the Bundesbank show that nine out of every ten euro banknotes issued in Germany are never used in payments but hoarded at home and abroad as a store of value. Not “rarely”. Not “infrequently”. Never. The notes are not in circulation at all but are stuffed under mattresses. Similarly, down under, the Reserve Bank of Australia (RBA) Bulletin for September 2017 notes that the value of notes “in circulation” has gone up 6% per annum for the past decade while the use for payments has collapsed (from two-thirds of consumers payments down to one-third) over the same period. It goes on to note that higher cash usage may be concentrated in “groups not included in the survey of consumers (who may well use cash more often than the average consumer)” as well as the shadow economy. Transactions. Here the trends are clear. Technology is a driver for change but that the impact is weak. In other words, new technology does reduce the amount of cash in circulation, but very slowly. Hoards. These are stores of money legally acquired but held outside of the banking system, like the 300 grand that Ken Dodd used to keep in his loft. If the amount of cash that is being hoarded has been growing then that would tend to indicate that people have lost confidence in formal financial services or are happy to have loss, theft and inflation eat away their store of value while forgoing the safety and security of bank deposits irrespective of the value of the interest paid. Stashes. These are stores of money illegally acquired or held outside the banking system to facilitate criminal behaviour. My personal feeling is that stashes have grown at the expense of hoards. In a fascinating paper by Prof. Charles Goodhart (London School of Economics) and Jonathan Ashworth (UK economist at Morgan Stanley), they note that the ratio of currency to GDP in the UK has been rising and argue that the rapid growth in the shadow economy has been a key cause. If you look at the detailed figures, you can see that there was a jump in cash held outside of banks around about the time of the crash, but as public confidence in the banks was restored fairly quickly and the impact of low interest rates on hoarding behaviour seems pretty marginal, there must be some other explanation as to why the amount of cash out there kept rising. Two rather obvious factors seemed to support the shape of the curve are the increase in VAT to 20% and the continuing rise in self-employment (this came up a couple of times in comments to that Guardian piece by the way), both of which serve to reinforce the contribution of cash to the shadow economy. Exports. The amount of cash that is being exported is hard to calculate, although the Bank itself does comment that the £50 note (which makes up a fifth of the cash out there by value) is “primarily demanded by foreign exchange wholesalers abroad”. I suppose some of this may be transactional use for tourists and business people coming to the UK, and I suppose some of it may be hoarded, but surely the strong suspicion must be that at lot of these notes are going into stashes. If, as I strongly suspect, the amount of cash being stashed has been growing then the Bank of England is facilitating an increasing tax gap that the rest of us are having to pay for. Cash makes the government (i.e. us) considerably worse off. In summary, therefore, I think think that the Bank’s view on hoarding is generous and that it is the shadow economy fuelling the growth in cash “in circulation”. Hence my point that it is time for Bank of England to develop an active strategy to start reducing the amount of cash in circulation, starting with the abolition of the £50 note as well as the ending the production of 1p and 2p coins (almost half of which are never used in a transaction before being returned to the banking system or simply thrown away). As it happens, the future of those coins and that note are the subject of a current HM Treasury “consultation”. I urge all you of sound mind to reply to the consultation and hasten their abolition here. The Taylor Report was released today. It’s a report about the “gig economy” and contains a number of proposals for reform in the labour market to modernise the various systems (e.g., tax and benefits) and improve the lot of workers. I don’t propose to comment on any of those proposals, also having recently entered the gig economy myself, I can attest to both benefits and annoyances, but I do want to comment on one point made by the report that was picked up in the media. Cash-in-hand payments to builders, window cleaners, plumbers and other trades people should be discouraged through a technology revolution to collect up to £6 billion more in tax, a Government-commissioned review urged today. Professor Charles Goodhart (London School of Economics) and Jonathan Ashworth (UK economist at Morgan Stanley) have studied the subject in some detail. They note that the ratio of currency to GDP in the UK has been rising (as you will recall from Figure 7) and argue that the rapid growth in the shadow economy has been a key cause. In their detailed examination of the statistics, the authors make a clear distinction between the “black economy” (e.g., drug dealing and money laundering) and the “grey economy” of activities that are legal but unreported in order to evade taxation. When your builder offers you a discount for cash and you pay him, you are participating in the grey economy. When your builder offers you crystal meth and you pay him, you are participating in the black economy. They define a total “shadow economy” as the sum of the black and grey economies. …Two rather obvious factors that do seem to support the shape of the Sterling cash curve are the increase in VAT to 20% and the continuing rise in self-employment, both of which serve to reinforce the contribution of cash to the shadow economy. The Bank say that there is “limited research to confirm the extent of cash held for use in the shadow economy”, but Charles and Jonathan make a reasonable estimate that the shadow economy in the UK could have expanded by around 3% of UK GDP since the beginning of the current financial crisis. …According to Tax Justice UK, that expansion means that there were £100 billion in sales not declared to UK tax authorities that meant a tax loss of £40 billion in 2011/12 and that will rise to more than £47 billion this year. The IMF have noted that while Her Majesty’s Revenue and Customs (HMRC) is not good at estimating losses outside the declared tax system, which is why their latest estimates for the tax gap are low at £33 billion for 2011/12. And while we all read about Starbucks and Google and other large corporates engaging in (entirely legal) tax avoidance, half of all tax evasion is down to SMEs and a further quarter down to individuals (according to HMRC). There are an awful lot of people not paying tax and simple calculations will show that the tax gap that can be attributed to cash is vastly greater than the seigniorage earned by the Bank on the note issue. Cash makes the government (i.e. us) considerably worse off. The suggestion made in the Taylor report should be uncontroversial. However, there are people out there who think that forcing law-abiding persons such as myself to subsidise money launderers, drug dealers and corrupt politicians is a reasonable price to pay because the alternative is unpalatable. In a world without cash, every payment you make will be traceable. My old friend Dominic Frisby is of course, completely mistaken about this. Whether the electronic money in your pocket is completely traceable, completely untraceable, or somewhere in between, is a design decision. As I point out in my new book (did I mention that I had a new book out?) where exactly that dial is set between anarchy and totalitarianism is something that our elected representatives should decide and then ask technologists to deliver. This is subject that I know a rather a lot about and so I can assure you that the technology that we already have is perfectly capable of delivering electronic money anywhere on that spectrum. My own prediction is based on William Gibson’s prediction in the pages of Count Zero. There, one of the characters in this future fiction notes in passing that “it wasn’t actually illegal to have [cash], it was just that nobody ever did anything legitimate with it”. Therefore I expect to see a variety of different kinds of anonymous electronic value transfer systems that are used to deliver pseudonymous electronic money systems and I expect some of those pseudonymous electronic money systems to be used by banks and others to deliver the special case of wholly traceable payment systems. That, however, isn’t the point of this post. The point that I want to make is that we need an intelligent and informed debate on what we want to replace cash, since it’s going to happen. It should be society that determines how it wants electronic money to work. Whether cash is going to burn out or fade away, we should be planning its 21st-century replacement now. It’s an interesting question to ask whether that means Bank of England Bitcoins or not! On which topic I was invited along to take part in the CSFI roundtable on “‘Formal’ digital cash: The currencies of the future?” with Ben Dyson from the Bank of England and Hugh Halford-Thompson of BTL Group last month. The event, held at the London Capital Club, was hugely oversubscribed, which I took to be evidence of renewed City interest in the general topic of digital cash and the specific topic of digital currency. My good friend Andrew Hilton, long-standing captain of the good ship CSFI, framed the discussion in his invitation ask the basic “what if”. “What if some central bank issued a digital coin that was as widely accepted as a bank note? Or, if not a central bank, what if a group of banks or payments operators issued a similar digital coin?”. For me, the roundtable was both an opportunity to plug my new book (did I mention that I have a new book out by the way?) and an opportunity to learn in the best possible way: by answering hard questions from smart people. I won’t attempt to summarise the discussion here except to say that there seems to be a lot of confusion about what form a central bank currency might take and it wasn’t limited to the people in the room. Now, why the IMF would define digital national currencies this way is unclear. A national digital currency, or e-fiat for short, may be implemented in any number of different ways. A “widely-available DLT-based representation” would be only one such option and even then it is not entirely clear what “DLT-based” actually means in this context. For that matter, it is not entirely clear what “DLT” means in this context either. It’s important to separate the topics to move the conversation along: do we need e-fiat and if we do, then how should it work? To the first point I think the answer is probably yes. To the second point, the answer is “well, it depends”. It depends on what we want the e-fiat to do. Should it deliver anonymity or privacy, for example. Should it work like M-PESA or Bitcoin? That’s a fun discussion. How much would it cost to set up “Bank of England PESA”? It wouldn’t even have 100m accounts and Facebook has a couple of billion. If they were to look at some form of shared ledger solution, where copies of the “national ledger” are maintain by regulated financial institutions (e.g., banks – whereby taking part in the consensus-forming process would be a condition of a banking licence) and the entries in those ledgers related to transfers between pseudonymous accounts (i.e., your bank would know who you are but the central bank, other banks and auditors would not) then it would be a permissioned ledger (without proof of work) that could work pretty efficiently. Either way, my point is that it’s doable, so we ought to do it.